This track sets the standard for Perth, and between its high-powered carts and the track itself, you and the whole crew are set to be challenged and put through the ringer! These machines are evenly matched, and the pit crew employs automatic timing, allowing you to keep an eye on those track times with pinpoint precision. It is very simple – the fastest member of the crew takes home the glory! Who doesn’t dig a dose of speed? These machines are not for the faint of heart, and you won’t be the fastest racer if all you do is pin the throttle. Get ready to brake, and brake hard, when entering corners – this is a proper racing machine! Bring your competitive side! There are few better feelings than skinning your best mates around a racetrack, so get your line right and drive hard! The sensations. The thrill of burning rubber, the smell of oil and gasoline, the vibration of a revving engine, and sweaty palms. This is the essence of motorsport, right here! The taunts. While a victory is sweet, perhaps the real value lies in the aftermath. The slowest driver has a long night ahead of them – as he should. Incentivise! Why not put down a casual wager on this affair? Perhaps the slowest man owes the group a round, or has to complete a challenge? This is sure to light a few fires when the flag goes down! 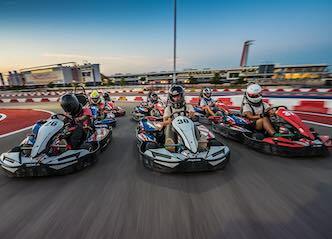 The Wicked Bucks ultimate karting package is a sure way to kick any bucks party into top gear! Start the day off with an epic race around Perth's fastest in-door track! You and the boys will then be treated to delicious platters of sliders as you take your party to your reserved party space at one of Perth's hot spots! Finally, as this is your best mate's last night of freedom, why stop the party there? We'll also organise guest list entry at the hottest club in town! Perth provides no shortage of thrills for the would-be party animal. If you, or a good mate, are looking to party it up in preparation for the end of their bachelorhood, you would be hard-pressed to find a better spot than this one! The key word is ‘variety’, and Perth can thrill from its urban centre all to the way to the bush outskirts. The Indian Ocean beaches on the western edge provide one of the most iconic urban beach experiences around, built for lounging in the sun and enjoying the cool waters. The interior areas, such as the Swan Valley and Margaret River, are dotted with vineyards, each providing a unique twist on their specialty drop. Enjoy the out of doors, then pair it up with some urban fun. Speaking of the out of doors, have you considered sampling some of Perth’s aquatic gifts? The Swan River boat cruise lets you enjoy the sights of this iconic waterway in style, with a drink in hand and a pair of lovely helpers to keep you all well-hydrated. Need even more adventure? Brave the ocean swells and head out for a deep-sea fishing mission! The choices are endless, and they are all yours. Back on land, have you tried axe-throwing? Bringing the group together to master this skill provides another dose of competition. It’s not about strength – the deadliest group member will have a good release and the aim to match! Hone those skills, then get ready for an evening on the town. Now that you’re suited and booted, keen for some world-class mixologists to put together a cocktail that will blow your socks off? Feeling a booth at the club? Maybe a more basic experience, with cold brews on tap and pub grub awaiting you? All of this is ready and waiting for you and the crew, so get in touch with our party coordinators here at Wicked, and let’s plan a banger!